Noopept’s co-creator Dr. Rita Ostrovskaya says it’s likely that it and other nootropics can help battle diabetes. This is another “notes” post, from Smart Drug Smarts podcast. If you read my post on the racetam nootropics, you know I hit on the sweet spot for piracetam dosing which was 4.8 grams/day taken in three, 1.6g doses. At the time, there were a lot of attempts to make piracetam better because of the aformentioned downsides. Her institute decided to switch gears and focus on peptides that have nootropic function. Peptides pros are that they are fairly safe. The downside is that they can be biologically unstable once ingested due to enzymes slicing and dicing them. This is especially true for longer peptides. Dipeptides (2 amino acids bonded together) have different properties though. They are more stable and cross the blood brain barrier easier. They started by looking at the structure of Piracetam and to see which peptides/amino acids could they “lego block” together to mimic that structure. 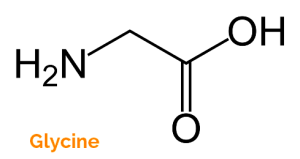 It turns out that proline and glycine mock Piracetam’s structure very well, and Noopept was born from those 2 amino acids. Glycine is fascinating as hell, btw. Get you some. So well that Noopept has about a 1000x more effective dose level than Piracetam1. When she and her colleagues did tests on rats and rabbits, they found very low toxicity. Probably because Noopept is treated like peptides in the body. She said that she has some experimental data that shows it is working to fight diabetes (no human trials because she has to get permission and it’s very expensive). Other substances show some promise also. How crazy is that? Nootropics for diabetes. But you might be thinking, “So…are the dosages for the nootropics effects similar for the effective dose for fighting diabetes?” She says it’s very early data and no one knows. If so, can noopept help? Hopefully further researches is done. Why am I interested in that? 5 grams of powder for $7.99 | 30mg/day will last ~166 days. If you want to protect your brain, use diet and supplement with noopept. Dr. Rita says it has no tolerance, but she recommends you take it for no more than 3 months before cycling off. She recommends cycling off 3 times per year. Up to 30mg/day can be taken. It’s metabolized very quickly, as all nearly all peptides. She’s 82 and has been taking noopept for years.